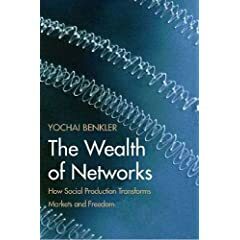 Yochai Benkler has followed a trend set by such people as Larry Lessig and Michael Geist, and made his new book, The Wealth of Networks, available under a Creative Commons License. He’s gone further than Lessig or Geist, I think, and has put the ideas in the book – which are all about commons-based and cooperative production – to the test in the real world. It will be of interest to anyone who thinks the whole concept of the Commons, Creative Commons, and ‘social production’ are interesting. Comments on this method of publication, and the book itself, over the fold. First, the making of this book into something that can be freely obtained is a significant move. Geist’s book, In the Public Interest, was a co-authored book (multiple academics contributing chapters), and was designed to be a policy-influencer, available at a time when copyright policy in Canada was hitting a high debating point. Wide distribution could be seen as a real plus there. Lessig’s book, Free Culture, was a book designed to appeal to a mass audience, and was authored (let’s face it) by someone who can with some justification be called an academic rockstar. It’s like U2 offering some free downloads. They will still be selling tickets and records, regardless. Benkler’s book is a different proposition. People expecting a Lessig-type book will be surprised. It’s a serious, academic book, which Benkler notes in the Acknowledgments has been more than a decade in the making. It’s gone through some reasonably intensive academic review, through work with Yale’s Jack Balkin and Bruce Ackerman, and student seminars at that fabulous law school. Read Lessig’s first couple of chapters (say, the Preface and the Introduction) and you know that this is a book of big ideas, written to be accessible and readable to a broad audience. Read Benkler’s Introduction and you’ve encountered information economics, a smattering of public choice theory; some political theory and theories of democracy; a sprinkle of technology and technology history. It’s not a light holiday read this one. It’s going to require some serious economic engagement. Why is it being made available in this way? The wiki puts ideas into action, because this book explores ‘the emergence of a new information environment, one in which individuals are free to take a more active role than was possible in the industrial information economy of the twentieth century’: in particular, Benkler is interested in ‘the rise of greater scope for individual and cooperative nonmarket production of information and culture’. He’s interested in open source software, Wikipedia, massive multiplayer online games (MMOGs); Project Gutenberg. He’s interested in blogs, and other forms whereby individuals can contribute to culture and the political economy. Mostly, he’s interestd in nonmarket production, and in particular, peer production through loose cooperative networks – and the challenge that such forms of production pose to ’20th century forms of production’, like the mass media. These are some of the big issues in this legal and technological space right now. Benkler has been thinking about these issues for at least a decade now. Benkler is now putting these ideas – not only into a distilled book – but simultaneously, into action – and perhaps, a little, to the test. He’s made a book which, however readable still contains some pretty complex ideas and some serious theoretical claims available to a mass audience to annotate, comment on, expand on, via that most democratic of technological mediums, the wiki. There’s a good chance this could be interesting. There’s a lot of bright people out there, in a position to comment on these big ideas. Those who are familiar with Benkler’s past work will recognise the broad thrust of parts of the book. Benkler’s past work on ‘commons-based production’ is in evidence (see Benkler, ‘Coase’s Penguin, or Linux and the Nature of the Firm‘, (2002) 112 Yale Law Journal), as are past claims about the way that strengthening proprietary rights benefits only certain kinds of intellectual production (See Yochai Benkler, â€œIntellectual Property and the Organization of Information Productionâ€ (2002) 22 International Review of Law and Economics 81). But there is more here, and Benkler is making a bigger claim than just that commons-based production can work (open source, wikipedia etc). He is also making a claim that the changes in the technological, economic, and social aspects of the information environment is important in allowing us, as a society, to pursue in a better way core commitments of a liberal democracy: individual freedom, a more genuinely participatory political system, a critical culture, and social justice. Exciting potential exists, although it will not necessarily be realised. I’ve not finished the book yet. In fact, I’ve made my way only (in a detailed way) through the introduction. But I’m pretty sure this will be one of those books you want to read, if you are interested in the kinds of things I write about on this blog. For those of you who have sometimes found Lessig’s ‘anecdotal’ style of writing frustrating, you may be more convinced by Benkler’s more academic, and rigorous approach. Read the book, or at least, read some bits, and do let me know what you think.